A Year of Being Here: Susan Browne: "Buddha's Dogs"
"Buddha's Dogs" by Susan Browne, from Buddha's Dogs. © HarperCollins Publishers, 1995. 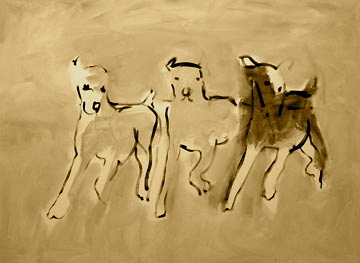 Image credit: "Running Beach Dogs," acrylic painting by Marie Mason, 2013 (originally color). It's Monday and this was just what the dr. ordered. I'm going to try to stop letting my own mind chase the same negative thoughts around the park today. This just made my day begin positively. Thank you!